As the days lengthen and the first signs of warmth, sun, and green grass creep into our lives, we’ve undertaken a super-exciting project: tapping the black walnut trees on our property to make syrup. 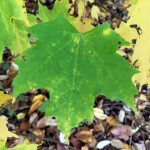 Although sugar maples are the tree of choice for commercial sugaring due to their high ratio of sugar to water in their sap, many other types of trees can be tapped to make syrup, including silver and red maples, hickory, birch, box elder, and walnuts. 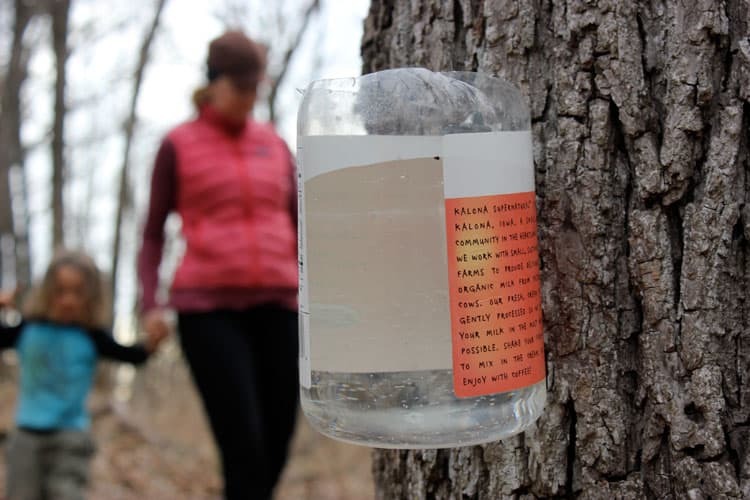 Having tasted the delicious, light, and refreshing sap of black walnut at our neighbor’s house last winter, we were eager to tap our own trees this year and to experiment with making black walnut syrup. Ideal tapping conditions are a combination of cold nights and warmer days. For most trees, daytime temperatures should be in the 40’s, although our black walnuts have flowed in daytime temperatures of 50-60 degrees. Updated to add: We have tapped for several years now, and have found that the tapping season can range significantly; in 2013 we tapped in March, whereas the tapping window in 2015 and 2016 was from late January – mid-February. My advice is to start keeping a close eye on the forecast starting in January. If you notice good tapping conditions, go ahead and put in a few taps and observe the sap flow. Get Ready for Backyard Sugaring Season Before the Snow Flies! First, we used a 5/16th drill bit to create a small hole for the spout. Gently hammer in the spout (we used this one from Leader Evaporator). 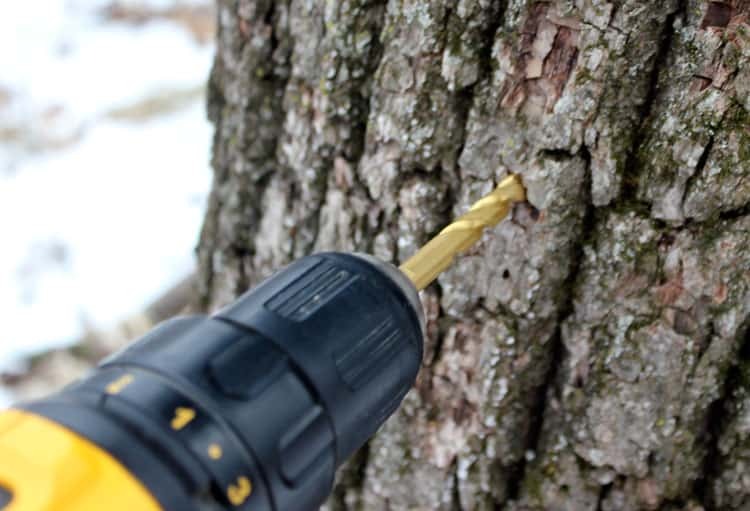 In our first year of tapping black walnut trees, Brian drilled holes in food-grade buckets to collect the sap. In later years, we invested in food-grade plastic sap collection buckets. We tapped 14 trees in total around the property, creating a sort of “sap line” that we walk each day. 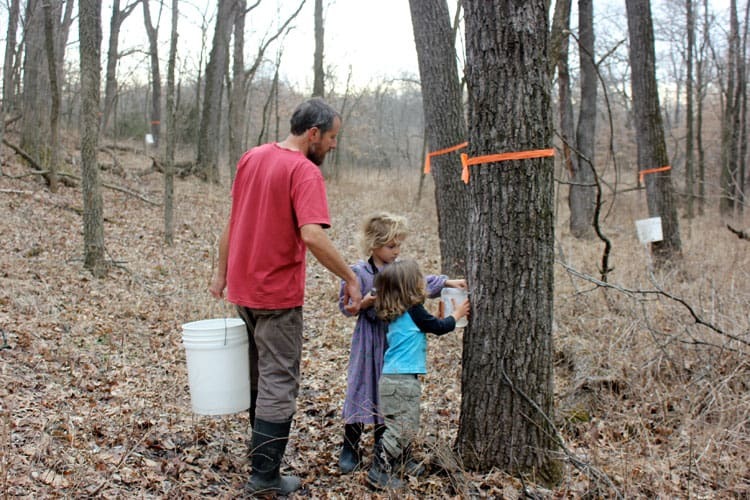 That, in and of itself, is such a satisfying process, noticing the trees in our woods, hearing bird calls, walking together as a family, as the kids get to help collect and pour the sap. Almost full to the top! 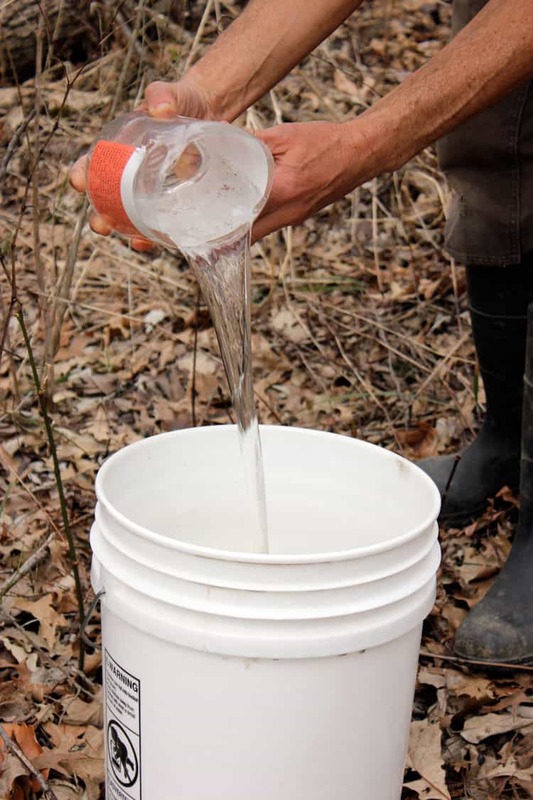 We pour each sap bucket into this larger 5 gallon food-grade bucket to bring it back home. The sap itself is full of nutrients, cold, with just a hint of sweetness. 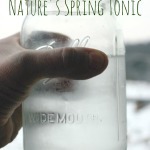 It is refreshingly light with a slight nutty flavor, and we will sometimes just drink it, as we consider tree sap an excellent spring tonic. Now it’s time to boil down the sap to concentrate the sugar content into syrup. 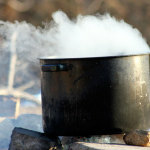 I highly recommend boiling the sap out of doors, as it produced copious amounts of steam that can leave a sticky residue on walls. How Much Sap is Needed to Produce a Gallon of Black Walnut Syrup? About 12 ounces of sweet black walnut syrup! It’s important to keep in mind that we were boiling down the syrup in a very rudimentary way, without measuring Brix, or the sugar content of the liquid. If you would like to be more precise, you can purchase a Brix refractometer for around $25. I would estimate that it took about 3 hours of continuous boiling to achieve the color and sweetness that we desired. What Does Black Walnut Syrup Taste Like? At first taste, black walnut syrup is intensely sweet, with a flavor that is distinctly different than maple syrup. I describe it as earthy and nutty; if maple syrup was the violin in a string quartet, I would characterize black walnut syrup as the cello. It’s just a bit deeper and more complex. Black walnut syrup can be used in place of maple syrup – on pancakes, yogurt, fruit, etc. Personally, I find the flavor to be so unique and distinctive that I reserve my black walnut syrup for fresh eating, rather than baking or cooking. Look outside – do you have a few trees that you can tap? Then do it! Making your own syrup is cost saving, fun, and oh-so-delicious. 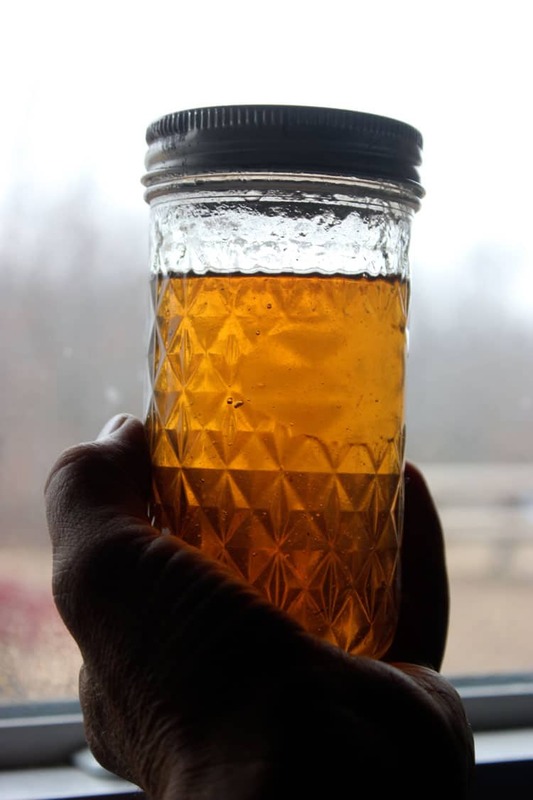 Backyard Sugaring: Get Ready for Sugaring Season Before the Snow Flies! I never knew walnut trees can be tapped! I wouldn’t tap black walnuts. The wood is too valuable. We tapped most of the trees lower on the trunk, so we could still use most of the tree, but I agree, it is a consideration for those looking to harvest their walnut wood. I would love to purchase some pecan and/or black walnut surup. Any idea where I can find some for sale? Unfortunately, no. Wish I could help! Check with me next month and i should have some more available for you to try. Thanks, Steve in Poconos, pennsylvania. Some people pay extra for tap hole maple; Why not tap whole walnut?? How cool is that! I love that you use what you have to serve your family the best. We live in the deep south so no tree tapping for us, but I do love reading about others adventures in tree tapping. Plenty of sycamore and river birch trees you can tap in the Deep South. have you tried using the Black walnut syrup in substitution for sugar in like oatmeal cookies or anything? We haven’t tried that yet, Cassandra. We have only gotten a little bit so far, so it is a precious topping! Oh exciting! I am always eager to try new things that are a tad bit off the beaten path! We have lots of black walnut! Thanks for the article!! If you try it, let me know how it goes! This is such a cool post! I just learned recently how much maple sap it takes to make maple syrup (now I finally understand the high prices!) I had no idea you could pull sap from other trees. I’m going to keep this in mind when I start house/land hunting. So cool! Yes, it takes a ton of sap! But so worth it. I am so curious about the black walnut syrup though- does it taste at all like black walnuts?! Yes, it definitely has a nutty and slightly earthy flavor, along with being very sweet. But it’s not at all unpleasant, just not maple tasting! Have fun with the box elders. I would love to try this! Is there a time limit on when it can be done? the snow is still too high to get to our trees! It depends on your weather. You will need a combination of cold nights and warm days, at least 40 degrees. Hmm… We have had a couple of warm days just recently but tonight we are to get another 6 to 10 inches. I’m really going to look into this. Have you done anything with the walnuts? This will be our third summer here and I am going to learn what to do with them besides throw them in the wooded area! Thanks for the info. Love what I have seen of your site so far! We got some walnuts from our neighbor this year, and enjoyed eating them. We only collected a few of our own nuts to make black walnut ink. Okay, you have my attention! So: 14 trees. 9 quarts of sap. 12 ounces of syrup. Did I miss it… How long did it take to collect 9 quarts? That was just one day, Jared! Sap is flowing this week! Wow. That is pretty great. How many days do you think you will be able to harvest? Working off of any particular rule of thumb, or do you just stop when the sap stops? Jared, it has been hard to find information that is specific to tapping black walnuts, so most of what I’m reading is referencing sugar maples. So what I’m reading is that the sap will stop flowing when the weather changes, and there is no longer the contrast between the cold nights and warm days. 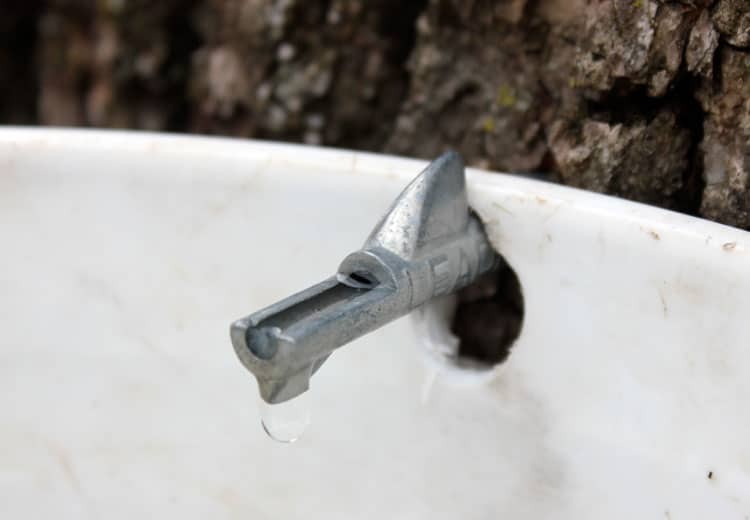 Depending on the weather, on the flow of the sap, & a host of other variables, it can take a while for the sap to fill the buckets needed to make syrup. Regardless, this Black Walnut Syrup sounds oh so delicious!!! Ma’am, TY for posting this….I learned something new today!! May the Peace of our GOD almighty reign in your house forever. Thanks for reading! The black walnut syrup has been quite delicious, and we still have two pints left for our winter enjoyment! Yes, it’s true that you can boil down most saps. I think it’s just a question of is it worth it? 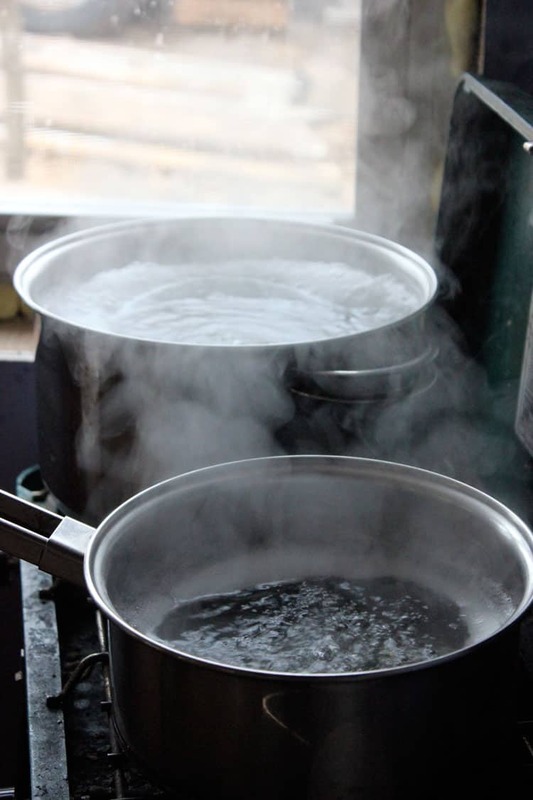 Some sap is just not as heavily concentrated with sugar, so you’d need to boil for quite a while! Still, in our area there are Box Elders, Maples, and Black Walnut which are all options. This is great. But I have lots of pecan trees. Will they make syrup? I have never heard of tapping pecan trees. I would suggest talking to your local extension service or forestry department, and see if they know the answer more definitively. All I can really say about tapping Pecan Trees is, try it. see if it can be done, find out what it tastes like, etc., & let us know…. Wow, Our son is getting 5 buckets, taps, covers and a book today in the mail for his 12th Birthday. I hope he enjoys doing this with Maple. Very interesting that you can use other sap trees. That is so great! What a cool birthday present. I hope enjoys it! Just to mention though – the tree needs sealing back up after with a bung, or it will be left open to infection and literally `bleed` to death! but bleed to death? that’s a new one on me…. I have never heard of a tree bleeding to death…. not saying it can not happen, just saying I never heard of a tree doing that. Up north we tap Birch trees as well as maple. The Grand Hotel on Machinac island serves it along with maple has a cleaner taste. I have heard good things about birch syrup. I’d love to try it some day! Fantastic post! This our 2nd season of tapping our maples, but never realized all of the others you could tap too. Thanks for reading, Karen, and I hope your tapping went well! They are a rarer tree around here but a few exist is Black Birch Trees , It is what “Birch Beer” is made from and the sap can be cooked down or fermented by adding some yeast. I got firewood logs one year with a few in the pile and when the sun hit it the sap would drip out of the logs. Great Article ! Thumbs Up ! Almost any liquid can be fermented…. the internet would also be good for gathering info…. Yes you can ferment the sap into alcohol indeed. Birch wine was a common treat at one point in history. I brewed ten gallons of maple sap beer last year and produced a very earthy brew. So Any sap capable of producing syrup can make a fine brew. Now my gears are turning on a nutty walnut brew?!?! That would probably taste great! There is a MO brewing company that makes a black walnut beer, but I’m not sure if they are fermenting the sap, or infusing the beer with walnut somehow. Great! Let me know how it goes! We just boiled down 7-1/2 gallons of sap into a quart of the most delicious syrup we’ve ever tasted. Wish we’d known about this sooner. My husband discovered the sweet sap by accident as he was cutting down some black walnut saplings that were overtaking the garden and apple orchard. Already looking forward to the autumn sap flow the make more. Oh, so wonderful to hear this! Isn’t it amazing? We finally did one last boil and canned all of our syrup for the year. I think we got a little over a gallon of syrup from several weeks of collecting sap from 14 trees. It’s so good! I have heard that Apple also makes some tasty syrup…. how true that is, I really have no idea because Sugar Maples are al I have ever done…. Am I miss calculating something, or is 12 ounces of syrup to 9 quarts of sap an amazing yield? According to my calculations that’s 1 to 24 syrup to sap ratio. I’ve heard typical ratio for sugar maple trees is about 1 to 40. Yes, it’s true it is a great yield. And the only explanation I have is that we are amateur syrup makers, and as such, are not testing our syrup for any particular consistency or sugar levels. In other words, we probably could have continued to boil down our sap to make a thicker, more concentrated syrup and come up with a smaller quantity. But it tastes pretty darn amazing, and has kept admirably on our shelf! 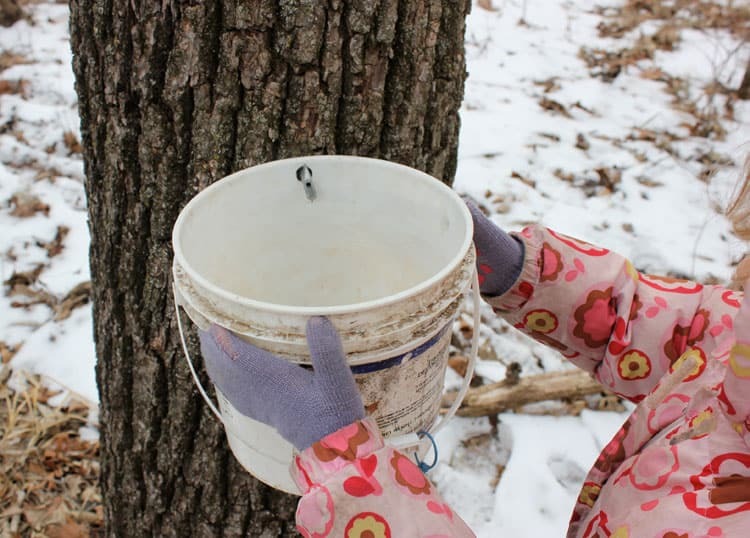 We are certainly going to be sugaring again this winter, and I will report the results! Cool, I look forward to hearing about it! By the way, having an off-grid homestead is something I dream of doing. It’s inspirational to hear of other people who are doing that sucessfully. Thanks for your blog! Thank you for reading it! i’m glad to share any information that helps others get to their dream! So are you saying you tapped 14 trees, got 9 quarts of sap, boiled it down and got 12 ounces? We have a forest of walnut trees and they are very invasive… popping up every where and are very hard to just pull out of our gardens. We use them for fire wood, building things, and to make tincture. We would love to tap them this winter but we are trying to decide how many to tap. We use about 2 gallons maple syrup a year so if we could cut that in half by using walnut syrup that would be great. I would probably not boil it all the way down either. Yes, that is right. And, just so you have the full picture, we did spend about a half hour each day collecting the sap, plus another few hours tending the fire and boiling it down (but that was all happening while we were working on other homestead projects). We have been using the Walnut syrup exclusively for the past 6 or so months and we have about 2 pints left. It was really worth the effort! Any idea on a range of temps for “cold nights” and “warm days”? I’m in NC so we can have days that are down to 30 or so and then get up to 50. I am stoked about possibly making my own syrup! I know a lot of crazy stuff but have NEVER heard of this. Great post! Here’s what I have found as a general rule on the internet: Sap flows when daytime temperatures rise above freezing (32 degrees Fahrenheit / 0 Celsius) and nighttime temperatures fall below freezing. What I like about it is that it addresses trees other than maples! Good luck tapping! We’re just now finishing the last pint or two and it’s been a real treat to have our own homemade syrup. The walnuts around here that will produce at least an eight-foot-plus log that’s a minimum of 18″ diameter at breast height are valuable. Catfaces, side limbs, nail holes, etc. can make the log almost worthless. We have a few big $4000-plus veneer black walnuts that I wouldn’t want to ruin by tapping. I will definitely, however, try tapping the walnuts that we wouldn’t ruin for timber. 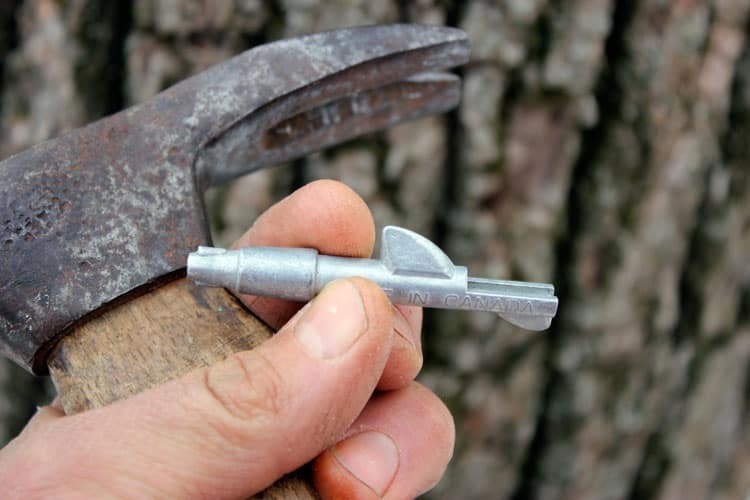 Also, tapping hickories? Wow, if that’s practibale, we will certainly give that a try along with the maples. Knew about the boxelder and birch possibilities, but not all the other non-maples. Hey, wouldn’t it be something if cottonwoods yield sap with any measurable sugar %? Any cut in a Cottonwood, esp, in the spring, results in a veritable FLOOD of sap pouring out. Those 4-foot-diameter cottonwoods would keep a guy running emptying buckets all day. I ‘m sure somebody’s tried cottonwooesk, though, and doubt cottonwood sap has much if any sugar content. I think you’re wise to protect your very valuable trees. Our property was just logged of the really valuable black walnuts before we moved here. We’re tapping low to the ground so we could harvest if we needed to. I’ve since heard that hickory, while tappable, is not all that common to tap – most hickory syrups are apparently made from the bark! But I would love to try them this year. As for cottonwood, I’ve never read anything about making syrup from them. Probably because, like you said, the sugar content is not high enough. How many trees would you say you need? It has been in the 50s all week and one of my black walnuts I have been getting quite a bit of Sap from. My others are not producing as much less than a few ounces today. Would you think it’s the weather or other factors? It’s hard to say! We’ve had a VERY slow week in terms of sap. While the days are nice and warm, the nights have not been cold enough for “ideal sap conditions.” Last week we got about 4 gallons in a day from 22 trees; today we only got 1 gallon from the sap number of trees. 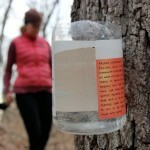 We already tap our maple trees, and tomorrow I am buying more spouts so we can tap our black walnut trees this season! Do you know of any other types of trees which can be tapped? Yes – lots of varieties of maples, birch, walnut, and a few others such as Box Elder. That’s exciting that you’ll be tapping the Black Walnuts! Wondering if you ever tapped English Walnut trees? We are trying that this year and I cannot find anything online about the ratio of sap to syrup etc. Any help you can provide I would be extremely grateful! Not sure if my question posted, so I’m going to try again. Wondering about English Walnut trees. Have you ever tapped those and what is the ratio of sap to syrup? I cannot find anything online. Thanks for any help you can give. I have not tried to tap English Walnut, although I have read that it is a tappable tree. I would imagine that the flavor would be very similar to black walnut. Does anyone know anything about sweetgum trees? We have a few black walnuts, hickory, and pecans here in our woods in East Texas; but what we really have in abundance is sweetgum! Since their sap can be used as a chewing gum substitute, I wonder if it can be used for syrup. I think the temperatures would have to be right – dipping into freezing at night and warm during the day. That’s what makes the sap flow in the spring or late winter. we found that the 40 gallon to 1 gallon yield was consistent across all 3 black walnut trees. The syrup was so good, we are expanding collection efforts for upcoming season, arranging tapping of black walnuts on other friends’ properties. Sooo many friends want this syrup. 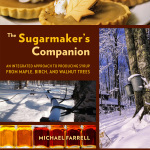 They say, and i agree it is way better than the best sugar maple syrup out there…. That’s great to know the ratio, as we didn’t keep such careful records! I agree with you that it is tasty stuff. We doubled our taps last year, but unfortunately the sugaring year was not a good one -our season was in late January! How far did you initially drill into the walnut trunk? I’m thinking of doing this. Hi Ben, you only need to drill about 1 1/2″ deep. I hope it goes well for you! Thanks, I will be trying this out! This saturday is our big walnut sap boiling party…. 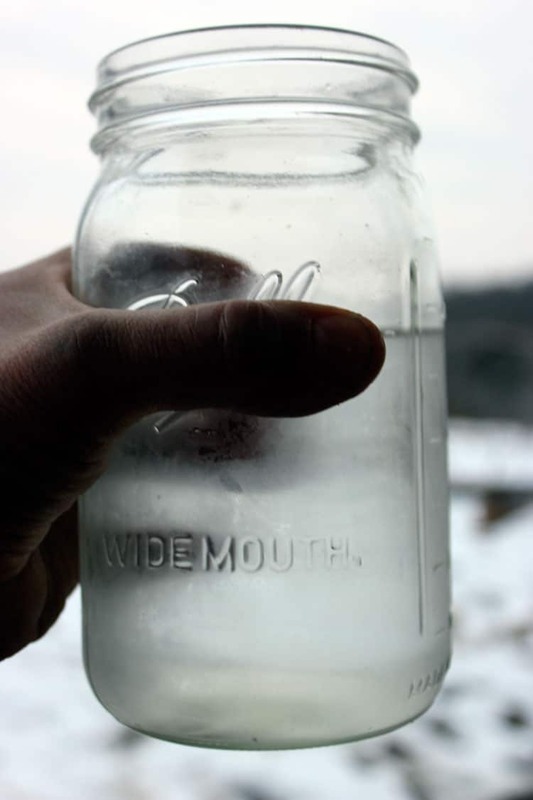 the local homestead group ( stroudsburg, pa) that just recently formed is coming over to have a sweet time evaporating the sap water! From 10 trees this year we got 200 gallons total. 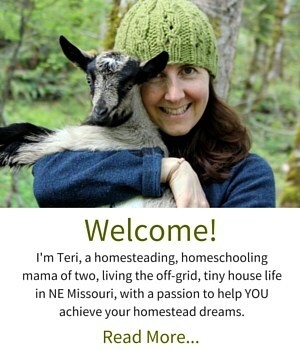 Very excited to share this fun hobby with friends and forest farmers-to-be…. find us on Meetup.com. 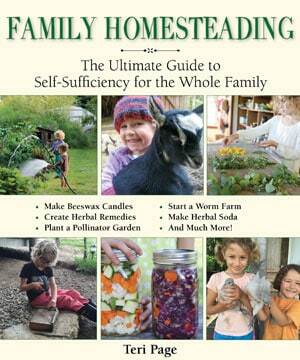 just search for Stroudsburg Homesteading….. Boil On!! That’s fantastic! I hope you guys have a great time! Teri, we have mason quarts, pints and half pints available to folks who want to sample the syrup. Any folks you send our way to buy syrup, we would be glad to send you a % of the sales as thankyou. Let us know if you do that sort of thing, thankyou and i love your blog. I do a variety of partnerships with small business owners, involving percentages, advertising, etc. Why don’t you send me an email at [email protected] and we can talk some more! Thanks! Wow – so cool! We have lots of black walnut trees on a family piece of property. I have so many fond memories of gathering and cracking open walnuts with my grandfather, but I never knew you could make syrup with the sap! If you have that many black walnut trees, you should definitely think about tapping! Just one caution: Please be careful about causing damage to an otherwise-good walnut tree that has a lower log of a dozen feet or so. We’re going to harvest some logs this year. Friends marked and took bids on half their good walnuts last year. Bids ranged from $79,500 to $123,000. Obviously they took the big bid. It pays to get someone knowledgeable involved to mark the trees, prepare the contracts, get the proper bonding, provide for what happens to the tops, what happens to surrounding trees, how they’re hauled away, etc. Good luck! This is a good caution for those planning to harvest black walnut trees. it is true that they are very valuable, and the tapping can cause damage. We do tap as low as possible, just in case we desire to harvest a tree or two, although larger-scale harvest won’t be in our future, as we are turning our property into a community land trust. Prior to the purchase of our land, the previous owner had logged all of the mature black walnuts, so our forest is already full of 3-4 ft wide stumps and the crowns that were left behind. Lucky for us, the crowns had large sections of very good wood that we were able to have milled and use in our home as trim and in our Etsy shop as cutting boards. A friend of mine told me that he knows a guy who had his woods logged of the Black walnut trees and then he dug out the stumps, pressure washed them, sandblasted them, and another power wash. He then sold the stumps to a carpenter who makes tables, seats, and gun stocks from the stumps. It sounds labor intensive but the money earned was well worth it. That’s good to know. They are rather large, so perhaps finding a way to make use of them would be worthwhile. Thanks for the tip! We have definitely had some cloudiness, as well as some separation and “goopiness” to our walnut syrup. We make sure we cook it down well, and then can it in sterile jars. So far, we have had no problems! But if I smelled anything funky, or saw obvious mold in the jars, I’d be concerned. Thank you for the help, I made sure everything was sterile so glad to hear the cloudiness is normal. Is there any special filtering to make it less cloudy? OH I am soooo glad I found this! I’ve been cursing all of the Black Walnut Trees on our property and telling the hubs to chop them all down! Now they can serve a purpose and we can keep a few around! I’m so glad! Black walnuts have been a wonderful addition to our homestead – dyeing fiber, making ink, making syrup, making nocino, occasionally collecting nuts. If you search black walnut on my blog, you will find lots of posts!